The success of Curse of Frankenstein in 1957 signified a change at Hammer Studios. After years of having moderate success producing a variety of films, the horror genre would soon become its primary focus. Having successfully adapted the classic Mary Shelley novel, it was only logical that their next adaptation would be Bram Stoker’s Dracula. 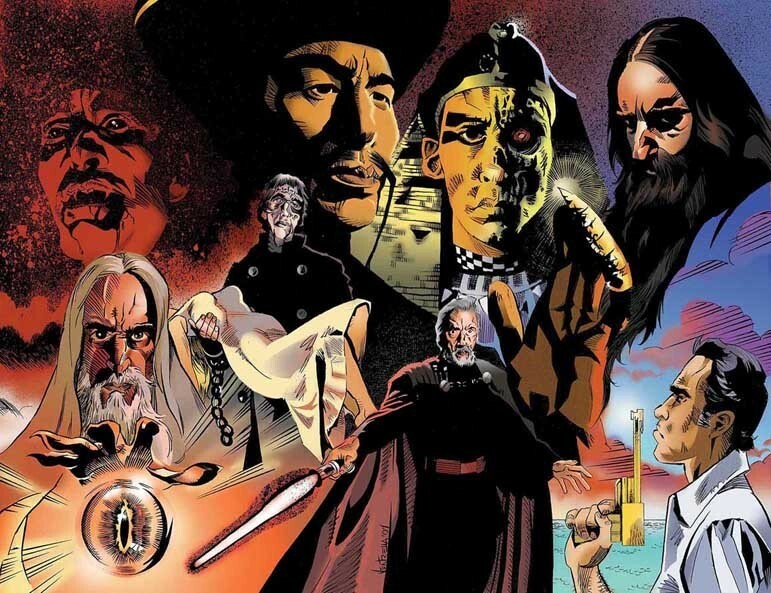 This time, Christopher Lee would assume the lead role in the film and take on a character that would define his career for the rest of his life. Securing the rights to the novel was not an easy task for Hammer. Universal had signed an exclusive rights contract with the Bram Stoker estate, ensuring that only they would be able to produce films with the character. This would explain why Dracula rarely appeared in a film by any other studio during this time. Hammer’s deal allowed for them to make the film but Universal had distribution rights in the United States. Ironically, Dracula became public domain in 1962, for better or worse depending on your point of view. The two driving forces behind Dracula (aka Horror of Dracula, as it was released in the United States) were two mainstays from the Hammer family. Terence Fisher was the director while Jimmy Sangster wrote the screenplay. Sangster would makes changes, some subtle and some quite obvious. You won’t find the Renfield character here while some names were changed. Yet, at its core, Dracula remains the same story. Johnathan Harker (John Van Eyssen, Quatermass 2) arrives at castle Dracula to become the librarian. He is quickly met by a woman who claims to be a prisoner only to quickly disappear when the Count arrives. Yes, she is indeed a bride of Dracula. 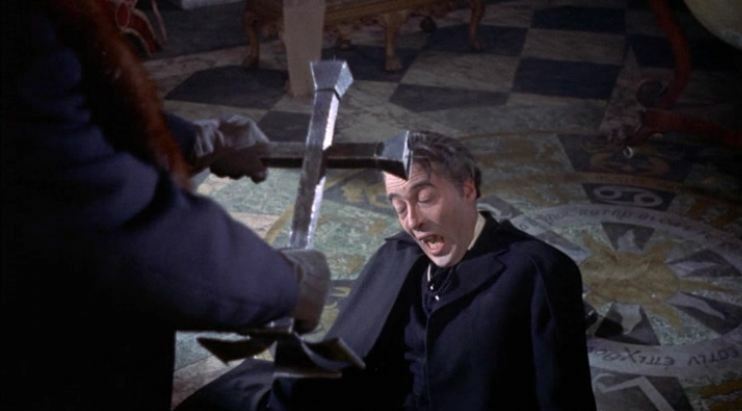 Christopher Lee initially enjoyed the role of Dracula. Not only did have speaking lines at the beginning of the film, he was not encased in makeup this time. His portrayal is perhaps a more sexual one that we saw Bela Lugosi display in the 30s and certainly surpasses Lon Chaney Jr. and John Carradine in that department. Yet, there is an intensity and underlying horror that was also absent in previous incarnations. Part of this is that it was now the late 1950s and certain restrictions once present in films were being lifted. Hammer was becoming the master at mixing the sexiness of their Hammer girls with ample amounts of that bright red blood, both of which would become the standard for Hammer horror flicks. 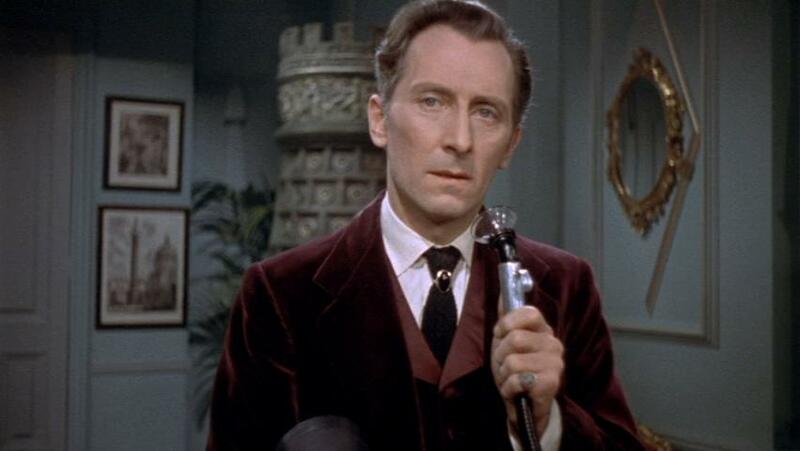 Lee’s good friend Peter Cushing plays the hero of the piece in Abraham Von Helsing. One difference here is that we are introduced to Von Helsing not in England but in the village of Klausenberg as he is searching for Dracula. He is quickly established as a hunter, dispatching of Harker after discovering him lying in a coffin. 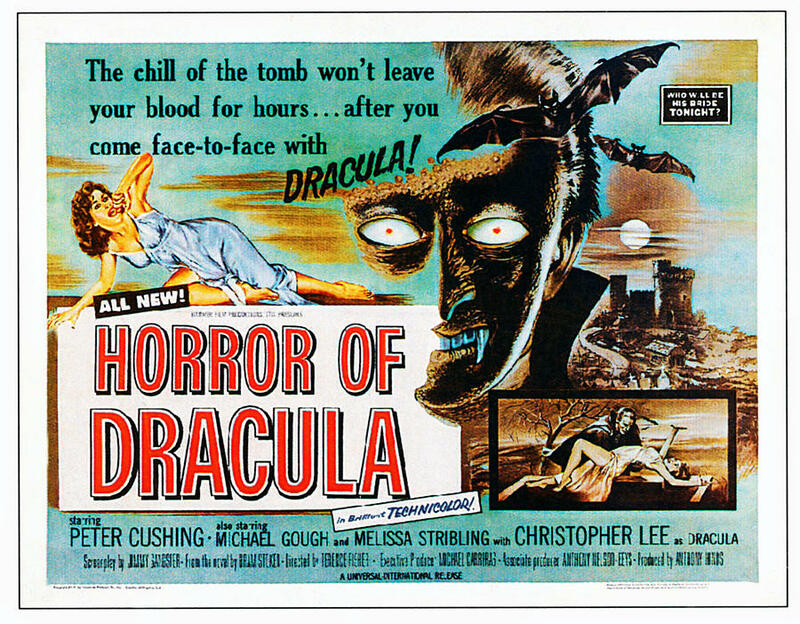 The story begins to follow more established guidelines with Harker’s fiancé Lucy (Carol Marsh, Scrooge) becoming the object of Dracula’s affections while her brother Arthur (Michael Gough, Black Zoo, Konga) struggles with the reality of the situation. Soon, sister-in-law Mina (Melissa Stribling, Crucible of Terror) becomes Dracula’s next target and the race is on to find out where Dracula lies. Lee’s performance as Dracula is stunning and iconic. Many actors in the years that followed would attempt to replicate the style in which Lee made the role his. He would go on to play the role six more times in the next fifteen years. But, he would not always be happy with the scripts and would try his best to distance himself from the character. Ironically, one of his more favorite Dracula films wasn’t even done by Hammer but by director Jess Franco. 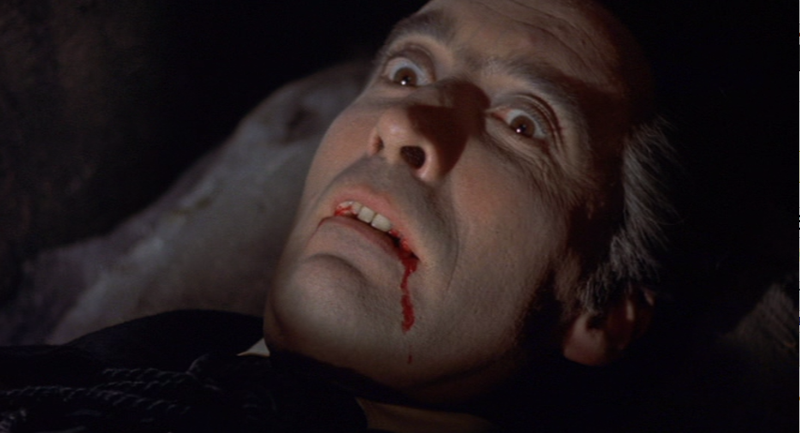 In Count Dracula (1970), Lee portrays the vampire as older and growing younger as he would drink blood, serving as both an elixir and a rejuvenator. In his autobiography, Tall, Dark and Gruesome, Lee would express how depressing it was to see the films deteriorate, a factor that ultimately made him decide to depart from the role after The Satanic Rites of Dracula (1973). But clearly, Lee owned the role and would forever be associated with the legendary vampire. Dracula would make him a star and would afford him great film opportunities in the future. Dracula (1958) was covered in the very first episode of the 1951 Down Place podcast. I highly recommend it as Derek, Scott and Casey have a passion for all things Hammer that is unrivaled. Next time, its 1959 and Christopher Lee is once again under the makeup fighting the ever-heroic Peter Cushing in The Mummy.